I’m keeping my fingers crossed that there will be no more snow this Spring. With the way the weather has been these past few months you never know. We had snow only a couple weeks ago! I think the Spring weather is finally here to stay now. This kind of weather is my favourite. Not too hot and not too cold. It’s t-shirt weather! My daughter, Bridget, loves the outdoors. She’s an active little girl who enjoys biking, jumping on the trampoline and just running around and enjoying life as a kid. I wish I had her energy! I also like spending time outdoors being active, but I usually pay for it the next day. This past week I was doing some raking in the yard. I was was picking up leaves to bring to the side of the road for our Spring clean-up. I spent about an hour outside, bending and shoveling this huge pile of leaves that were left from the Fall. The next day I could barely walk! I think I overdid it. I told myself that the job needed to be done and I was tired of looking at the yard mess, but boy did I ever feel out of sorts. My back and arms were the areas that hurt the most. I don’t have the luxury of staying in bed all day to rest and recover so I managed my symptoms using a muscle rub. RUB A535 has been in my medicine cabinet (and my parents medicine cabinet too!) for as long as I can remember. RUB A535 Natural Source Arnica Gel-Cream (or Spray) is one of the newer products I’ve tried. It’s made with 100% naturally sourced Arnica montana. I remember a few years ago my chiropractor recommeneded I use Arnica on my sore neck muscles! 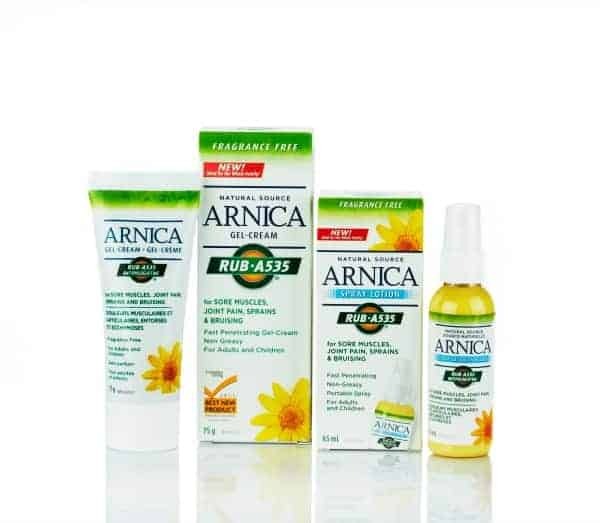 RUB A535 Natural Source Arnica Gel-Cream helps to treat inflammation and muscle soreness and can be used by all members of your family age 2 and older. For kids, you can use it on their bumps and bruises. It’s non-greasy and comes in a portable tube so you can keep it in your bag if you’re out for the day. Speaking of things to do outside….I’ve got a few things that you can enjoy this month, weather permitting of course! Make sure to pack the RUB A535 Natural Source Arnica Gel-Cream or Spray if you over-do it. 1. Gardening (or Yard Work): It’s time to prep the yard for the warmer months. Get rid of leaves or debris that may have blown into your yard over the winter. If you’ve got a green thumb, plant your flower beds to make the yard nice and pretty. 2. Join a league: Sports are a great way to get active and meet new people in your area. In our area, there’s a softball league for women. 3. Visit a local playground or park: Take the kids and head to the playground with them. If you’re feeling nimble, climb the jungle gym! I like to visit our local park down by the waterfront. 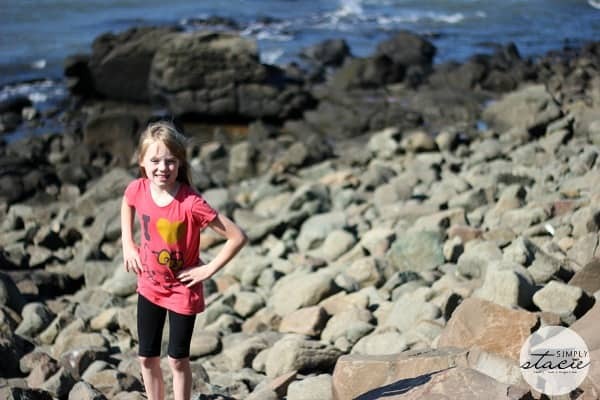 During low tide, we walk on the rocks and look for crabs and other little critters. 4.Camping: Go camping even if its in your own backyard. It’s been years since I’ve gone camping and I think it’s due time for a trip. What are some of the things you are looking forward to doing outside this month? Join the #TangerineTwist Twitter Chat Kick Off! I really need that spray for sore muscles. That would help me great with all the yard work I have to do in the summer. I like that you can use this on younger children too. We have a bike trail and park right across the street for the kids and it is so nice that the kids don’t have far to go and play. Going on more walks and just being outside! what about swimming? here in arizona thats the BEST way to enjoy the outdoors! This seems like a handy little tube to have around. I can’t wait to camp on the beach this summer. Happy Wednesday! I have started to garden and have planted seeds for many items. I have got slug bait the new kind safe for animals etc. I still want to pick up some more flowers to plant. I want to be outside more that is for sure no matter what I do. Just recently I have heard a lot of good things about Arnica gel. My daughter is going to get some. She keeps having sprained ankles and bruised feet. We can’t figure it out, but arnica gel was recommended to us. Nice to see you are using it too. I am hoping spring will find us permanently next week. This week is still not so great, but the sun is out today. Enjoy your time and remember to have fun in the sun! I love the working outdoors to, but also pay the price for doing it, but I will be getting the RUB A535 Natural Source Arnica Gel-Cream and trying it this weekend! We’ve been doing a lot of gardening the last few days. We’ve also been on a couple hikes. We’re looking forward to heading to the beach this weekend and hopefully going to the ocean next week! My boyfriend and I love to go hiking. We live in rural New Jersey, and there’s really no better place for it. The mountains are absolutely gorgeous this time of year.